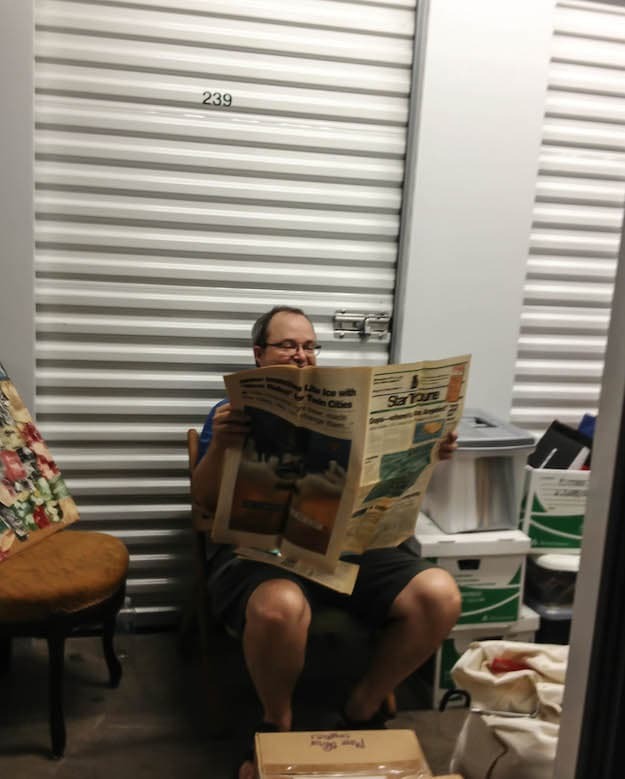 This is Tom helping cull through storage. He’s reading “Not the Star Tribune” parody, published by City Pages in 1994. Remember when you could count on seeing your young adult children–whenever they needed to come home to do laundry? Or the times you’d invite your post-college kids to dinner, knowing that they needed a good, home-cooked meal? It starts out the same for boomerang parents as it does for the younger boomerang generation. At first we were just visitors, stopping in long enough to do our laundry. Pretty soon we were getting nutritional advice and cooking tips from our son, who demonstrated with the occasional dinner party or green breakfast smoothie. 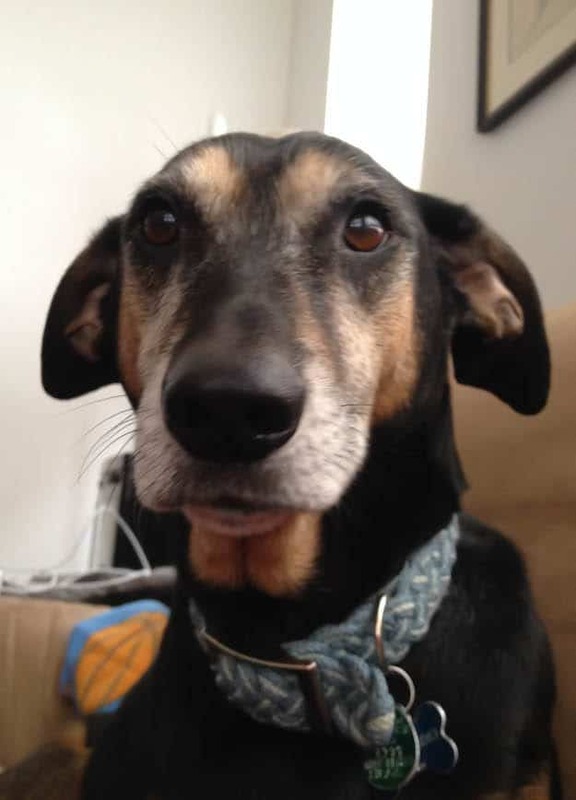 Then we were ‘apartment sitting’ when we were in town, and if the children weren’t actually off somewhere and in need of dog sitting and mail pick-up, they graciously vacated to stay with their friends. We’ve even been allowed to use their cars. These days we’ve dropped the pretenses and have, essentially, a designated bedroom, just a step away from moving in with the next generation. To be a boomerang parent, of course, you first have to leave. My husband Tom and I accomplished that almost four years ago when we sold our house and cars, stored some stuff, and left Minnesota to travel around the world. But like college kids, we came home for breaks which, for us, generally meant two times a year. It didn’t take long to realize we were more at home on the road than we were coming back to Minneapolis sans house and garage. We’ve managed our lodging here in just about every way imaginable, short of pitching a tent in the backyard. (And no, the answer to the most oft-asked question, we do not travel by RV.) When visiting the homeland, we’ve stayed in hotels, in friends’ extra rooms, in large luxury homes while the owners were away, at Tom’s mother’s Iowa home six hours from here, and in a number of places where dogs or cats need a caretaker for a weekend. Gus, the main reason for our visits. Jane loans him out for snuggling. We tried not to infringe on our children’s space or lifestyle. Matt (30) and Jane (26) have their own lives, jobs, apartments, friends, cars, refrigerators, dogs, and cats. And until recently they had their own beds and couches. They’ve made space for us willingly and graciously. They change the linens, dust and pick up, and treat us as we treat them: get it yourself. Last summer we were wanting to assess our storage (who could remember what was in there?) and consolidate some stuff and put other things to better use. At the same time, Matt was moving into a three bedroom apartment with his girlfriend, Amy. A third roommate backed-out, leaving Matt and Amy with a little more apartment than they wanted to pay for. At first, that clever Matt suggested we buy a place ‘for the future’ and they would rent from us. But that wasn’t going to work, mainly due to lack of interest on our part. But it was a good exercise in economics. You want to pay how much for rent? Which bedroom do we get? By this time, Amy had returned from her summer travels so she and Matt could consider options together. We were invited to rent the third bedroom from them. (Inertia is a wonderful thing. Who really wants to move?) They were spared having to move, and we could whittle down storage and have a sure place to stay when we were in town. We downsized our storage significantly and overstuffed the bedroom with our bed and bedding, dressers, sweaters, shoes, luggage, and a couple file boxes. Some boxes went to the small storage area here at the apartment, and more boxes take up part of Matt’s office. Our rent plus storage costs us about $130 more per month than we were paying for storage alone. The way I figure it (Tom calls it rationalization) that’s less than a couple nights in a hotel. Win-win. We still travel most of the time, so we are dreamy roommates: rarely home. They travel, too, so we’ve had the place to ourselves this month. That’s the story of how we became early adopters of the Boomerang Parent generation. We’re waiting for the trend to be discovered and reported on. But when the media and Pew Research come calling to ask us how it’s done, I’ll offer these pointers for happy coexistence. Linx (Links?) 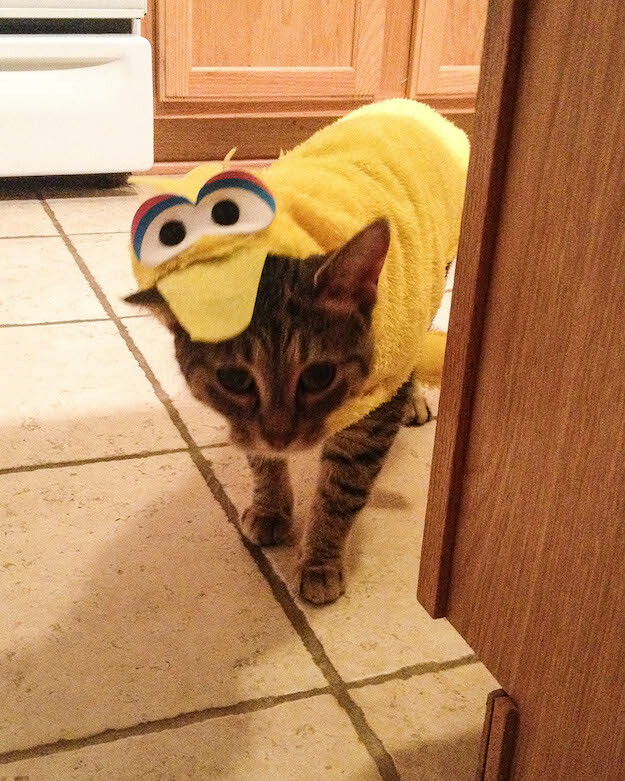 the Kitty is preparing for Halloween, or an artful dodge from Gus. Kids: If you don’t want your parents using that fancy olive oil and balsamic vinegar, stash it beyond their reach. Same goes for anything else you don’t want them to see or use. Parents: If you use the last of the mustard or toilet paper, go buy more. Replace what you use. Pick up your stuff! Put coats away, contain your electronics, and keep everything else in your own room. Do not threaten to kill the cat, or worse, bring a dog over to murder it for you. Respect your children’s household habits, especially if they work from home. No distracting TV, music, or bodily noises while they’re at home. Get your calendars together every now and then so everyone knows who’s where. Dinners together are fun. Trade off on the planning, shopping and cooking. Be the best roommates you can be: stay away as much as possible and pay the rent on time. Wow! You just outlined my plan for when Jim and I retire. Two daughters, two houses, two bedrooms for us to stay in. We do this when we visit now, but I foresee that our “visits” will get longer. They say they are prepared for us to have our own designated bedroom in each of their houses! Yay! Corinne, they say that now, but just wait. We’re here at their apartment for another day, and I’m guessing they’ll be glad when we’re back on the road. • Do not threaten to kill the cat, or worse, bring a dog over to murder it for you. I wonder who might have been guilty of THAT particular offense? He’s said the same about my cat(s). I pretend he’s just teasing. You are always welcome to hang out here if you want to get out of the kids’ way for a bit. Gus hates cats. He can’t help it. He’s a real dog. This is hilarious, and also so practical! What a nice arrangement you guys have. It’s lovely that you’re relaxed enough as a family to do this and have it work (relatively) smoothly! Thanks, Sam. I enjoyed reading your interview with Iker and Endika, too! Hope to visit the restaurant some day and meet you somewhere along the road, too. Would never happen in our family. When we visit for brief periods we stay in a motel. For starters, I’m allergic to our son’s family’s dog and cat. And I really need my space- but I remember when he moved in with us for a while after traveling with no base. It was 18 years ago, How time flies. We used to do that, too, but we aren’t here very often, so it works out for everyone. Tom, Kris, aren’t you cold? When are you coming back to SMA? Anne, we’ve just escaped to Napa for a couple weeks. I hear we have Minneapolis friends attending the SMA Writers’ Conference this year. I wish I were among them, but this year Tom and i are taking road trips closer to Tom’s mother’s home. Next swing through MX! Brilliant. But I don’t know if I could keep from slipping into an unwelcome Mom mode. Plus, the stable, married kid just got a cat and Mr. Excitement is allergic, so I hope we don’t have to return to Philly before our subtenants move out. (BTW, SMA sounds nice). Yes, Suzanne. Tread softly (like a cat?) to keep from slipping into old roles! New kids by marriage are a big help:) I assume you’ve shipped the dog out for the duration, so as not to have to put up with a cat! What’s your return date again? Enjoy, enjoy.